Don't forget that all of our Huawei devices are fully unlocked and sim free for all UK and International customers. You can even switch up your sim or service provider at any time as the handsets will remain unlocked. International and worldwide delivery is generally within 1-2 working days via FedEx, with full 24 month warranty. Don't forget if you're purchasing outside the EU you'll pay the Ex-VAT price. Offering a FullView Display, with a stunning new 6-inch screen and 18:9 display ratio, barely-there-bezel and HDR10 technology, the Huawei Mate 10 Pro shows the world in intensely vivid and bright colours. Crafted out of Corning Gorilla Glass, the Mate 10 Pro provides a high end resolution of 1080 x 2160 pixels. The world’s first Kirin AI processor brings you a faster, stronger, and seamless smartphone experience. With cutting-edge 10 nm tech, an 8-core CPU and 12-core GPU, the HUAWEI Mate 10 Pro delivers premium performance at lightning speeds using much less power. The industry-leading 4000 mAh battery with smart battery management ensures power-waste is minimized and battery life maximized. 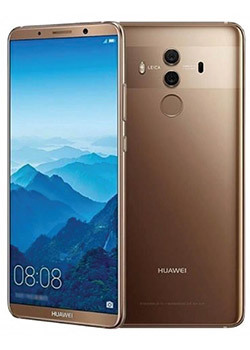 Featuring a strong and robust glass casing both front and back, the Huawei Mate 10 Pro offers a uniquely elegant design. An innovative technique is used to heat the toughen rear glass to 700°C before shaping, to deliver the ultimate style. The ergonomic curved glass fits snugly in the palm and feels as good as it looks. IP67 rated water and dust resistant, the HUAWEI Mate 10 Pro can handle whatever life throws at you. With the new Leica Dual Lens with f/1.6 aperture you can create beautiful shallow depth of field pictures, crystal clear low-light photographs and blur-free shots of objects on the move. The 20MP monochrome sensor and 12MP RGB sensor with Optical Image Stabilization captures more lighten and intelligent photographic algorithms automatically adjusts color, contrast, brightness, exposure. Powered by AI the Mate 10 Pro will ‘learn’ from a data cache of portrait images to evoke a professional bokeh effect on the go.